Erin Miller | Galion Inquirer Galion senior Matt Kingseed teeing off during the Mid-Ohio Athletic Conference golf tourney at Valley View on Thursday. Kingseed and his fellow Tigers shot a school-record score of 294 to far surpass the conference competition in the annual tournament. 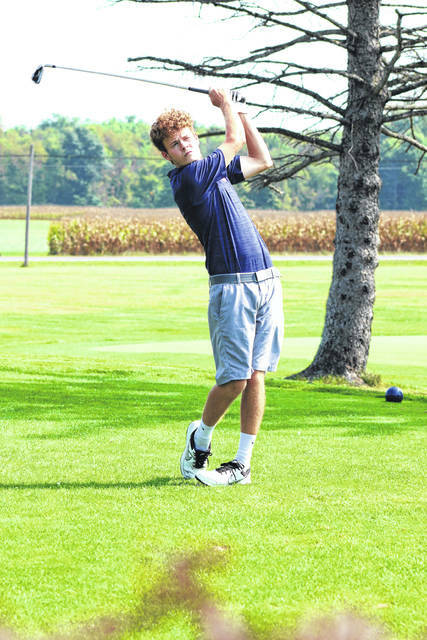 GALION — There’s little doubt who has the best golf team in the Mid-Ohio Athletic Conference. Ater finishing the regular season at a perfect, 14-0 — for the second year in a row — the Galion Tigers easily defended their league title during action Thursday at Valley View. 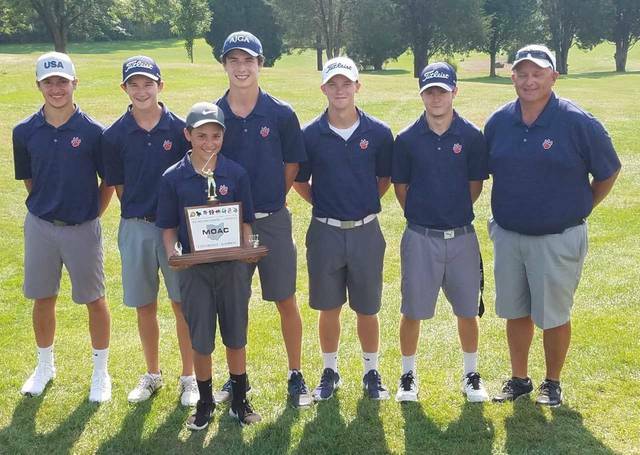 Galion’s team score of 294 was easily better than Buckeye Valley and Ontario, who finished second and third with a score of 347. Rounding out the field were: 4. Clear Fork- 353; 5. Pleasant- 360; 6. Harding- 374; 7. River Valley- 379 and 8. Shelby- 385. On Tuesday, only six players in the MOAC shot scores in the 70s. Four were from Galion. With a 71, the Tigers’ Matthew McMullen was the medalist. After shooting when he called a “disappointing” front-nine score of 40, McMullen fired an impressive 31 on the back-nine. Teammates Jack McElligott and Spencer Keller had 74s. In a tie for fourth place, Kaleb Harsh of Galion and Brock Dettmer of Clear Fork shot scores of 75 apiece while Lane Thomas of Ontario came in sixth with a 77. Matt Kingseed shot an 84 for the Tigers while Max Longwell rounded out the Galion competitors with an86. Kingseed and Longwell’s scores would have been kept scores on all other teams in the field on Thursday. “I just kept giving myself good opportunities and if the first shot wasn’t the one that I was looking for, I made up for it on my second shots with my irons.” McMullen missed eagle putts on the 13th and 17th holes. Head coach Bryce Lehman had a lot to say. MANSFIELD — On Monday, Galion was fourth at Westbrook Country Club in the Lexington Shoot-Out. The Tigers were the only Division II team in the 15-team field and shot a team score of 316. The winning team came from Mason, shooting a 303 to outlast the runner-ups from New Albany (313) by 10 strokes. Oscar Zimmerman of St. Xavier was the medalist, with a 70. Maxwell Moldovan from Green was named the Shoot-Out champion, finishing with a score of 72. In total, their were 90 golfers in action at Westbrook on Monday. The two sophomores from the orange and blue turned in the lowest scorecards for Galion on the day with McMullen shooting a 74 to tie for fourth place and Keller firing a 78, good for a 13th place tie. Seniors McElligott, Harsh and Kingseed turned in the next three lowest scores for the Tigers. McElligott shot a 79 to tie for 18th, Harsh an 85 (tie, 39th) and Kingseed a 91 (tie, 61st). Freshman Longwell rounded out the Galion roster, shooting a 98 and tying for 79th. Rounding out the team scores were: 3. Dublin Jerome- 314; 5. St. Xavier- 318; 6. Pickerington North- 324; 7. Green- 324; 8. Lexington- 333; 9. St. John’s Jesuit- 336; 10. Ashland- 338; 11. Lancaster- 343; 12. West Holmes- 352; 13. Mount Vernon- 355; 14. Findlay- 359 and 15. Wooster- 374.
https://www.galioninquirer.com/wp-content/uploads/sites/38/2018/09/web1_IMG_0582.jpgErin Miller | Galion Inquirer Galion senior Matt Kingseed teeing off during the Mid-Ohio Athletic Conference golf tourney at Valley View on Thursday. Kingseed and his fellow Tigers shot a school-record score of 294 to far surpass the conference competition in the annual tournament.